This is a very simple mac n cheese, and you can dress it up many ways if you like something more exotic. Have some bacon or pancetta in the fridge? Cut into bite-sized pieces, fry it up in a pan, and toss with the cooked pasta before adding the cheese sauce. Or I like to do the same with oven roasted tomatoes if I have some of those on hand – add to the cooked pasta and then add the cheese sauce. And you can play with the cheese flavours as well. Old or extra old cheddar is a must. You want that cheesy bite. I prefer to use white cheddar…no need for colouring. If I have Boursin on hand, I’ll use some of that instead of the cream cheese. You can add a little bit of blue cheese, but not too much as it is so strong. Really, you can keep it simple and you’ll have a great cozy meal. Or you can play with different combinations and find your favourite. Bring large pot of salted water to a boil. Cook macaroni until al dente. While pasta is cooking, in medium saucepan combine milk and flour. Cook over medium-high heat until mixture begins to bubble, about 8 minutes. Whisk while mixture is heating up to avoid lumps. Stir in onion, mustard, paprika, cream cheese, 1 ¾ cups of the cheddar cheese and ¼ cup of the Parmesan cheese. Add salt and pepper. Stir until all cheeses are melted and you have a creamy sauce. 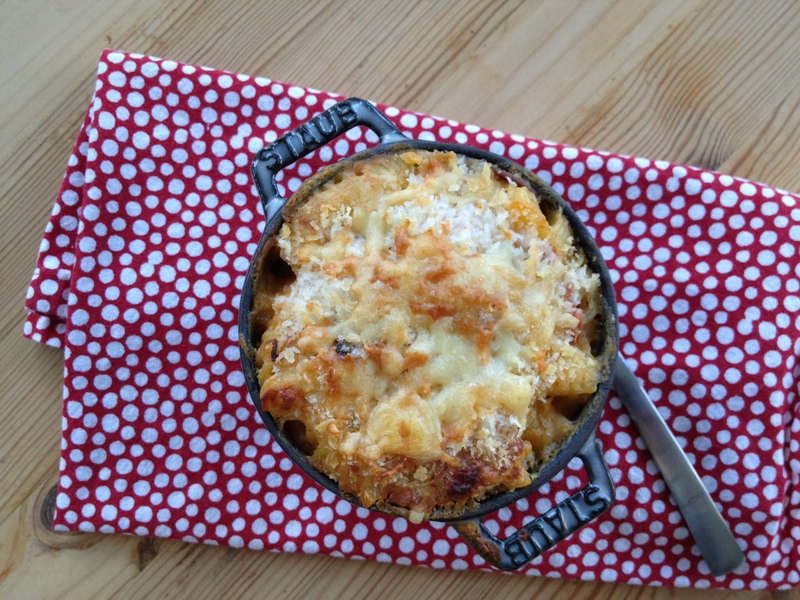 Transfer cooked macaroni to a baking dish. Add cheese sauce and stir until noodles are coated. Mix breadcrumbs and remaining cheddar and Parmesan cheese. Sprinkle over top of the macaroni.